Tag line: "Swinging From His Toes And Shooting From His Hips...Roy Battles His Foes With A Song On His Lips!" Even those who’ve never seen one of his films have likely heard of Roy Rogers, the singing cowboy who starred in over 100 movies and had his own TV and radio shows in the 1950s and ‘60s. Though he occasionally appeared as a supporting player early in his career (he had a small role in Dark Command, with John Wayne), Rogers soon became a star in his own right, often playing the hero (who, quite coincidentally, was usually named Roy Rogers). 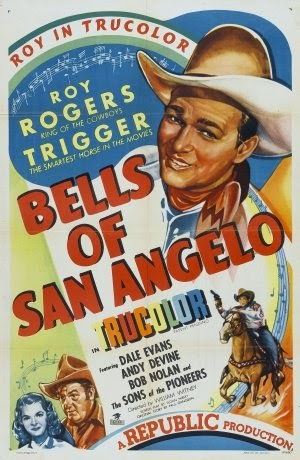 Directed by William Witney, who would helm some two dozen of Rogers’ movies in the late ‘40s and early ‘50s, The Bells of San Angelo teams Roy with many of his regular co-stars, including his wife Dale Evans; his Palomino horse, Trigger (who actually received second billing), and Andy Devine, who adds a bit of comic relief as the sheriff wanted by Scotland Yard. The Bells of San Angelo sees Rogers playing an officer with the border patrol sent to the small town of San Angelo to investigate a possible smuggling operation. But before he can speak with his key witness, the young man is gunned down by guards working for an American mining company, who claim he had stolen from them (they go so far as to plant a nugget of pure silver on the dead man’s body). Realizing there’s something strange going on, Roy decides to hang around for a while, a decision that doesn’t sit well with the mine’s boss, Rex Gridley (John McGuire). To further complicate matters, Roy receives a telegram from his superiors telling him noted western fiction author Lee Daniels is coming to town, and that he should allow the writer to tag along with him during his investigation. Expecting a man, most assume Daniels missed the bus when he doesn’t turn up, but in reality, Lee Daniels is a woman (Dale Evans), who, after learning that Roy doesn’t care much for her writing, tries to conceal her identity. As if all this wasn’t enough, British lawyer Lionel Bates (Olaf Hytten) shows up on the scene looking for a man named George Wallington Lancaster, which, unbeknownst to everyone, was the real name of the local sheriff before he changed it to Cookie Bullfincher (Andy Devine). Fearing the worst, the sheriff tries to leave town soon after Bates arrives, but Roy convinces him to stick around, especially since he’ll need his help squashing the smuggling operation (which threatens to turn deadly before he can close the book on it). To be honest, I always felt Roy Rogers was a much better singer than he was an actor. As with most of his films, his character in The Bells of San Angelo is squeaky clean, and though he can hold his own in a fight (which he does more than once in this picture), Rogers’ goody-two-shoes image usually won out, even if the situation called for him to get down and dirty. As a result, I often find him the least interesting character in his own movie, though he does impress us on a few occasions with his singing voice (his “A Cowboy’s Dream of Heaven” is a pretty little tune). Faring a bit better is Dale Evans as the writer trying to hide her true identity, and it’s always fun to see Andy Devine turn up in these movies, playing a character much like the ones he portrayed in such John Ford westerns as Stagecoach and The Man Who Shot Liberty Valance. Story-wise, The Bells of San Angelo delivers the goods, providing a handful of thrilling moments, and, once the British lawyer enters the picture, we’re even treated to an old-fashioned fox hunt (with a raccoon standing in for the fox)! While I may not think much of his acting, there’s no denying the mark that Roy Rogers left on the western genre. And thanks to films like The Bells of San Angelo, it looks as if his reputation as the west’s most heroic singing cowboy is here to stay.